Despite the crowds, the many miles still to come, and the newest blister on my right heel, I couldn’t ignore the fact that it was, truly, an incredible view. Halfway through the Presidential Traverse in New Hampshire’s White Mountains, four friends and I cheered as we summited Mount Washington. The tallest mountain in New England, Washington is notorious for it’s year-round bad weather, so it was a small miracle that the five of us reached the peak on a warm and windless August day. We were treated to panoramic views of the Whites below us in every direction, and I took a few seconds to look to the Southwest, towards Monroe, Franklin, and Eisenhower, three of the peaks still to come. “Let’s get a quick photo before we keep going!” a friend suggested, and the rest agreed. I, however, hesitated. Grumpy from fatigue and hunger, I had turned into a poor sport and had no interest in posing for a photo or lingering any longer amongst the crowd on the summit. Eventually though, my friends convinced me to sit myself on a rock overlooking the range and get in a picture with them. A few days later, after I got a few meals and some good sleep in me, I logged into Facebook to find that they had posted their pictures from the hike. The images made me smile, and I was glad my adventure companions had ignored my protests and gotten me in the frame. Those photos conjure up memories from that entire day, even of the many parts that were never captured on film. Although, there are also times when I wonder if our experience on the summit would have been even better if left unphotographed. Though they are nice to look at, I certainly don’t need pictures to remember a hike that special. Maybe knowing that the view was only for us and that we would never get it again would have made those moments above treeline that much more powerful while we had them. At its best, I think social media can serve as an incredible tool to keep people connected and to celebrate their high-points with one another. 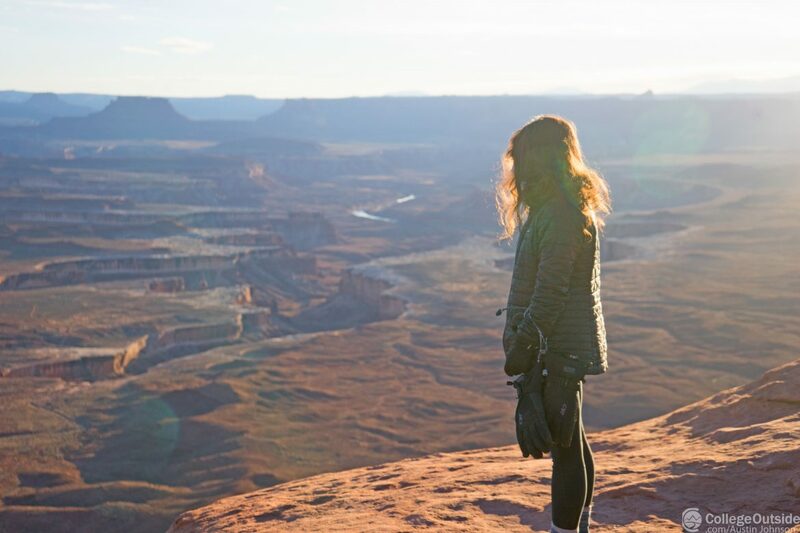 Though I was on the other side of the world this March, I still could follow many of my friends from school as they backpacked in Canyonlands and kayaked across the Southeast. At its worst though, social media can feel like the scoreboard of a silent competition, an unhealthy game where the objective is to prove that the places we see, the things we do, and the lives we live are better than everyone else’s. Personally, whenever I share my outdoor exploits online, I sometimes like to ask myself, “why am I posting this?” I want to share my experiences with the friends I am separated from and prove to my parents that I’m still alive, but sometimes these motives aren’t alone. Immediately after posting my own content, I find myself opening and re-opening my social media accounts, eager to read comments and see how many ‘likes’ I’ve received. More likes and more comments from friends professing their jealousy means more points on the scoreboard. It really is amazing to have a smartphone and a video camera at my fingertips, but I worry I’m losing something by trying to capture these memories for future public display, if posting about adventures makes them harder to appreciate in the moment. Recently, I asked for an action camera as a birthday present and I now wear it occasionally when I bike and kayak. I was excited with the new opportunity to share these sports with the people I don’t get to ride and paddle with, but wearing a camera has created a noticeable change. Where my mind used to wander freely, I now spend a great deal of energy worrying about the device strapped to me. Is it recording? How is the lighting right now? Does this trail look epic enough on camera? Admittedly, I have thought of more than one Instagram caption while still biking. When all this starts to detract from my experience, I try to remember a small phrase I picked up recently. “Footy for Mom,” I say to myself, a reminder that these photos and recordings are for sharing with the friends and family closest to me. Even if the audio is terrible and the camera lens has mud all over it, I can trust that they will be the ones who will still be happy to watch clips and, more importantly, listen to the stories that go along with them. So thanks, Mom. Amidst my concerns about my own use of social media, I am grateful for those around me who seem to have achieved their own sort of mastery of it. My roommate for the past three years (soon to be four!) is the finest night sky and landscape photographer I have ever met. His images rarely include human subjects, and instead they focus on the natural beauty he encounters on his trips. Already a humble guy, I love that the pictures he shares online invite the viewer to appreciate these stunning vistas alongside the photographer, rather than acting as a call for attention to his own impressive skills. Another friend also excels at online photography, albeit in an entirely different way. With her iPhone at the ready, she snaps pictures constantly, often at times that I might otherwise overlook. She shares these photos in bulk, welcoming everyone to comb through them while forcing no one to do so. The result is a collection of moments, the kind that mean the world to those lucky enough to be a part of them. These two and my many other talented friends like them are my social media heroes. Their images make me feel welcome, not excluded, and they take pictures for reasons far greater than online fame. I hope to become more like them in the near future, to take photos for myself and the people around me, and to quit worrying about the scoreboard. I’m sure I sounded like a technophobe through all this, an old man complaining about the kids these days and how nobody takes the time to stop and enjoy the simple things in life anymore. I have no doubt that I’m destined for future greatness as a curmudgeon. Nevertheless, until this whole internet fad passes, I will keep recording Footy for Mom, I will take photos for the memories, and sometimes I won’t take any photos at all, when the impermanence of the view will make it all the more special. Because when seen through my laptop screen, an iPhone photo from the summit of Washington doesn’t impress me. It’s the chance to reminisce with friends about blisters and bad moods that makes the whole ordeal of posing for a photo worthwhile.